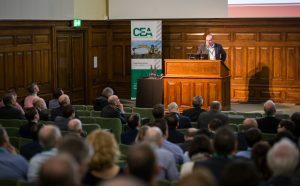 The recent CEA Annual conference (One Great George Street London) was attended by over 190 delegates from the Construction Equipment sector, including guests from leading contractors Balfour Beatty, BAM Nuttall and Keltbray. The conference also attracted guests from Government departments such as the Department for International Trade. CECE’s (Committee for European Construction Equipment) Secretary General, Riccardo Viaggi also made the journey from the association’s headquarters in Brussels especially for the event. The conference was followed by a Celebration Dinner, featuring celebrity comedian, Hal Cruttenden. 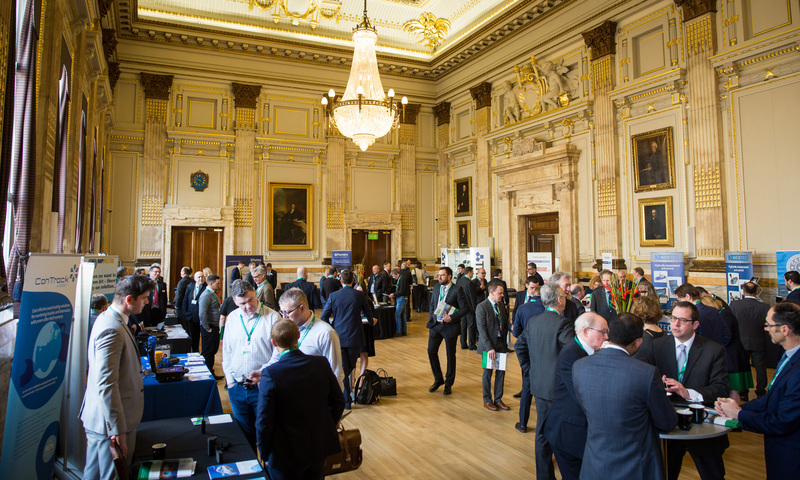 The conference, generously supported by headline sponsor, Perkins and others, explored digitisation, future fuels, the importance of Big Data, robotics and augmented reality training. 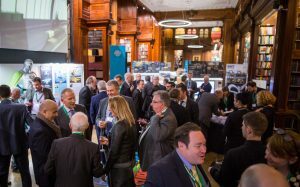 The event was both thought provoking and informative and lifted the lid on some of the hottest topics and challenges facing the construction equipment sector. 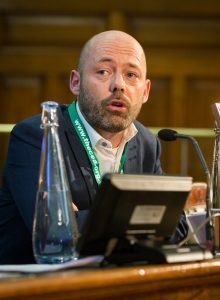 BBC broadcaster and journalist Nick Higham was once again the conference moderator. 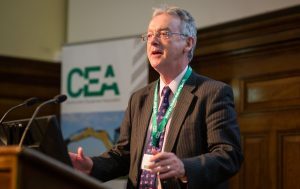 Kicking off the proceedings was the CEA’s first Honorary President JCB’s David Bell who confirmed that we are living in exciting times and digitisation is everywhere, he said, “Everything is changing, and everything is up for grabs. 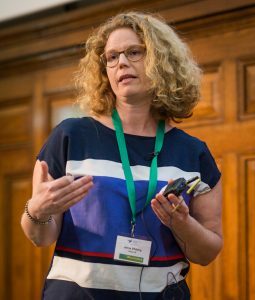 We need to be effective and efficient in all we do.” Which was a very apt statement as the construction sector is rapidly shifting into a digital-first world. Duncan Riding, Senior Technical Steward, Perkins Engines was the first of six speakers to address the delegates. Riding spoke about fuels of the future and how energy is the 2nd most important issue to the human race. “Our entire society is based on energy. By 2100 there will be 11-billion people world-wide all consumers of energy” Said Riding. Riding went onto explain that diesel isn’t the ‘demon’ fuel it’s made out to be and the advances in filtration efficiency in engine systems (SCR technology), which includes the addition of DPF filters and Ad Blue, emissions from these technologically advanced engines are at an all-time low. Riding also said that battery engine technology needs to catch up. Battery powered scissor lifts and forklifts have been around for some years and more recently we have seen fully electric excavators – but a zero-emission machine still needs a high flow of energy. A 22kw charger is equivalent to using 40 x 13-amp plugs. Riding’s message was clear – it’s clean diesel for larger machines – not electricity. 53% of the energy in the UK comes from fossil fuels. 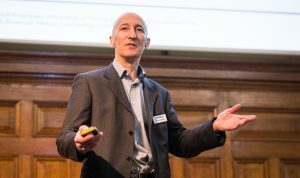 JCB’s David Bell also touched on the future of fuel in his opening speech – he was also of the opinion that batteries are not the answer and that we are in danger of getting caught in Clean Air zones which will ultimately prevent things being built. City regulation is making life complicated. 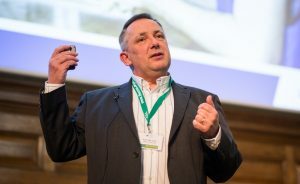 Professor Rab Scott, Head of Digital, AMRC (the Advanced Manufacturing Research Centre) with Boeing discussed the factory of the future and the challenges and opportunities for the construction sector. Scott introduced the audience to the 4th Industrial Revolution which is using Blade Runner style digital technologies to transform the productivity of UK manufacturing. Scott highlighted the 5-key technologies which are drivers behind the 4th Industrial Revolution; these are Additive Manufacturing (3D printing), Virtual and Augmented Reality, Robotics and Automation, Machine Learning and Artificial Intelligence, Data, Connectivity and the industrial Internet of Things. Next on Scott’s agenda was The Internet of Things – the interconnected manufacturing environment. Data analysis plays a crucial role – data is knowledge. By analysing data from now and the past we have the tools to predict the future. We have the foresight to predict what’s going to happen and transform to knowledge. With this knowledge we have the ability to optimise energy, predict maintenance, and produce higher quality parts which in turn would result in less scrap. Scott went on to describe how Virtual Reality training is playing a key role in the future of our industry. The ‘Gamification of Training’ is enticing new blood into the world of engineering. Children and young adults are by their very nature competitive and want to be ‘top of the leader board’ in gaming – we need to capture this desire for ‘winning’. VR training also enables people/trainees to communicate with manufacturing processes more efficiently. Kennedy and Hawkins were talking to the audience from an operators’ perspective and how machines used on modern day construction sites need skilled operators. Construction machines are becoming more and more sophisticated and the operators need to be coached on how to use these advanced technologies safely and efficiently. UK Operators believe that utilising machine simulators is the way forward to not only train and upskill existing workers in new machine technology, but also to attract the interest of new young plant operators – where there is an acute skills shortage. 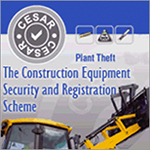 The company is currently working with Hinkley Point C where more than 250 operators have already taken the training. They are also working with BAM Nuttall training operators to prepare for working on the Antarctic research base camp revamp. The simulator has also made its way into many schools to reach the ‘Xbox Generation’. Simulators take the ‘danger element’ out of training and an operator can practice in ‘virtual’ hazardous situations rather than onsite where a whole host of problems present themselves. It’s also very cost effective as multiple candidates can be trained at once, and the simulator benefits from extremely low running costs, in comparison to a machine onsite burning fuel etc. Operators also benefit from a wider scope of learning with multi machine types. Increased operating hours allow for faster learning which is returned tenfold when the operator arrives on his/her new jobsite. Hawkins noted the very low literacy and numeracy skills of some construction workers was a barrier to embracing these new technologies. Until the education system can catch up with the reality of the work place it is putting the brakes on the highly digitalised intelligent machines coming from manufactures being fully embraced on the job site. Following a networking lunch, which was sponsored by Marubeni Komatsu, CanTrack and Trimark Europe, the afternoon session began with technology maverick, data scientist and innovator Inma Martinez, who substantiated that the future really is now and how the digital tsunami has caught many off guard. Martinez reported that the 4th Industrial Revolution started to get attention in 2010. Technological change is exponential, and we won’t experience 100-years of progress in the 21st century – it will be more like 20,000 years of progress – calculated at today’s rate! Martinez also said that R&D will need to be design-driven and data-driven. Switch R&D off and create a department striving to create the next innovative products that deliver commercial success, rather than a scientific testing division, where new technologies are studied and appreciated. She predicted that innovation will be a growing force that will propel companies to remain competitive, to deliver improved products and services and allows for higher competitive advantages. As part of this programme, Volvo CE has been working with Skanska and the Swedish Energy Agency on the electrification of a working quarry site. Volvo looked at a complete site with a customer and discovered it was not a case of replacing one machine with another – they must replace one process with another process. The demo will be run in Sweden during Q3 and Q4 2018 for the duration of 10 weeks. 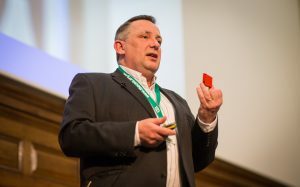 Elfsberg said exponential technologies will disrupt the world and include automation, electromobility and connectivity. Also, globally, labour-productivity lags behind manufacturing and the total economy. This is why she believes that ‘electrification’ matters for site efficiency and productivity – also to build a sustainable future. 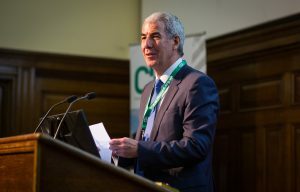 Rob Oliver, Chief Executive CEA (Construction Equipment Association) closed the proceedings and announced the plans for the forthcoming Plantworx exhibition and the collaboration with Rail Media and the new Railworx exhibition. Railworx, will run alongside the Plantworx exhibition at its new East of England Show Ground, Peterborough location (formerly the home of the LAMMA agricultural show), taking place from 11th– 13th June 2019. 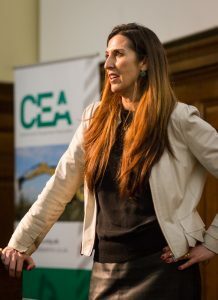 The presentations from all the speakers are available to CEA members on the CEA website at www.thecea.org.uk. 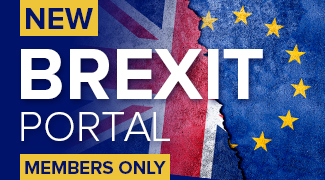 Non-CEA member delegates please contact louiseamurphy@aol.com for copies of the presentations. 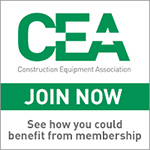 The CEA would also like to extend thanks to the Sponsors of the Innovation is Here conference – their continued support of the CEA and its involvement in working with the CE markets is much appreciated. The headline sponsor of the event was Perkins followed by JCB, Plantworx, Marubeni Komatsu, SMT, TriMark Europe, CanTrack, and McCloskey. The Celebration dinner and celebrity comedian, Hal Cruttenden, was sponsored by KHL, CESAR and Datatag with Nylacast kindly donating a table. The dinner was attended by 130 guests.